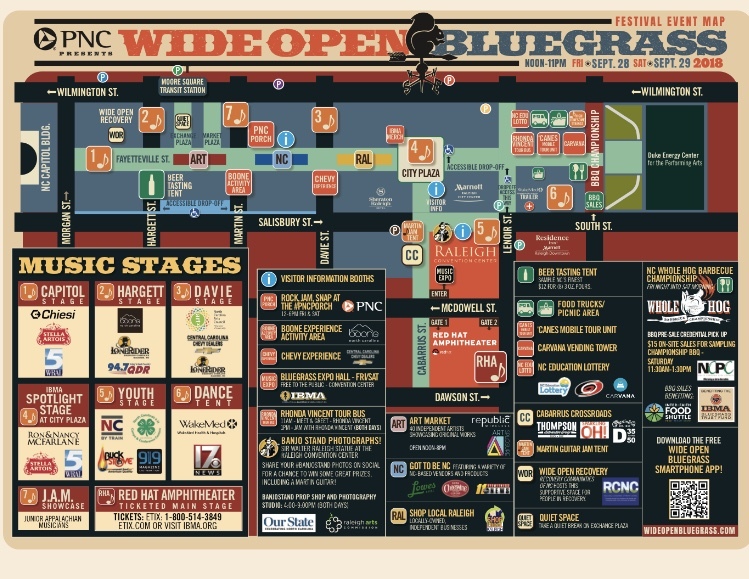 The High Lonesome Strings Bluegrass Association will be a part of the free 2018 IBMA World of Bluegrass Street Wide Open Bluegrass Festival in Raleigh, NC. The HLS stage will be on the corner of Fayetteville Street and South Street in Downtown Raleigh . Bands will be performing on Friday the 28th and Saturday the 29th from 10am until 11 pm. 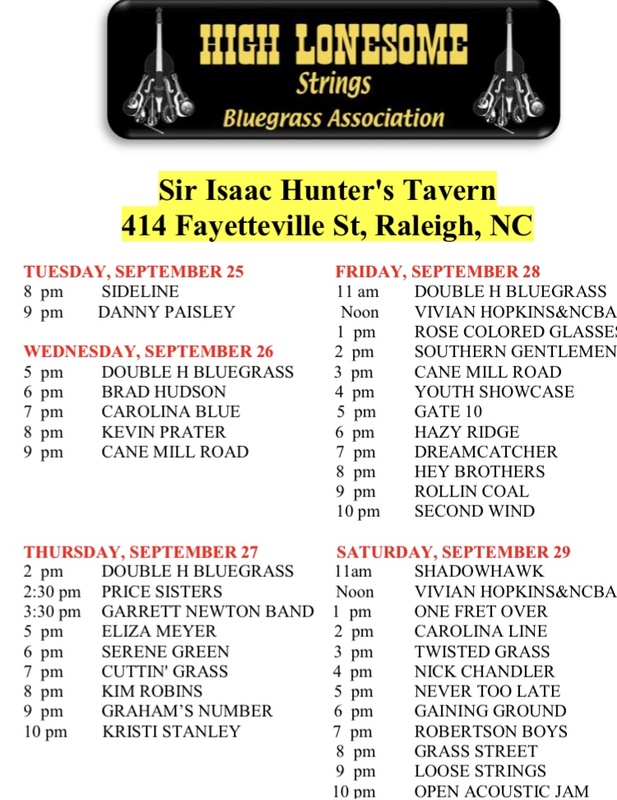 Also check out the bluegrass all week at Sir Isaac Hunter’s Tavern! 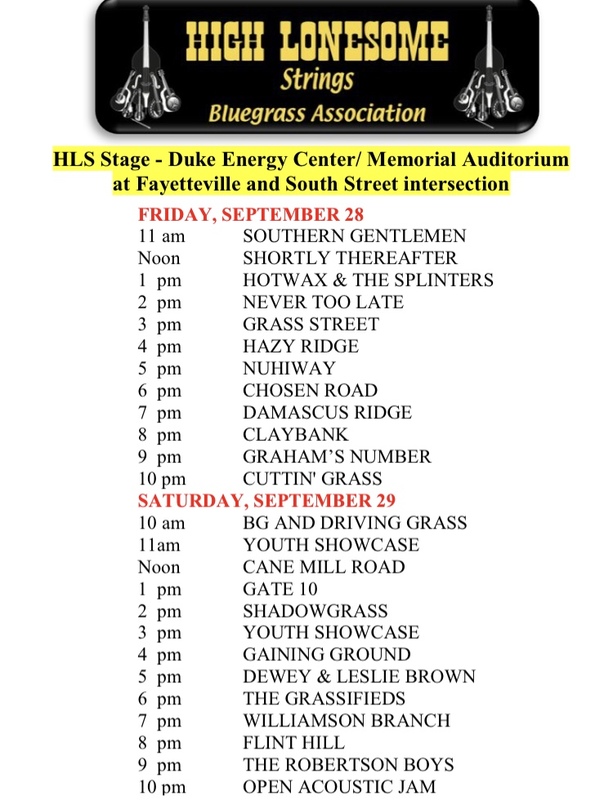 We are extremely excited that the High Lonesome Strings Bluegrass Association will be a part of the free IBMA World of Bluegrass Street Fair in Raleigh, NC in September! The location will be on Fayetteville Street between Lenoir Street and Morgan Street in Downtown Raleigh. Dates are Friday the 27th and Saturday the 28th from noon until 11 pm. At our club tent, we will showcase our talented HLS bands and you are welcome to come participate and jam and help share HLS information. In order to encourage young musicians, student memberships will be awarded free during the two days at the Street Fair. Elizabeth Greeson is still setting up the volunteer time slots so please contact her as soon as you can! For more information please contact Elizabeth Greeson at Greeson.elizabeth@yahoo.com.